The vine leaf maple (Acer cissifolium) is a small species of maple tree. This Japanese native will put on a fall display, though it may not be as impressive as other species. It looks a lot like its close relative, the Japanese maple. The botanical name assigned to this species is Acer cissifolium and it is part of the Aceraceae (maple) family. The name cissifolium is used because the leaves resemble those of species in the Cissus genus. In addition to vine leaf maple, you may see ivyleaf maple, vine-leafed maple, ivy-leaved maple, vineleaf maple or ivy leaf maple. This tree is not actually related to the ivies, which are found in the Araliaceae (ivy) family. This maple tree is able to grow in Zones 5-8. It originally comes from Japan. At maturity Acer cissifolium will be 20-30' tall and wide. When it is in its youth it has an oval shape. As the years go by it will change to more of a round shape. 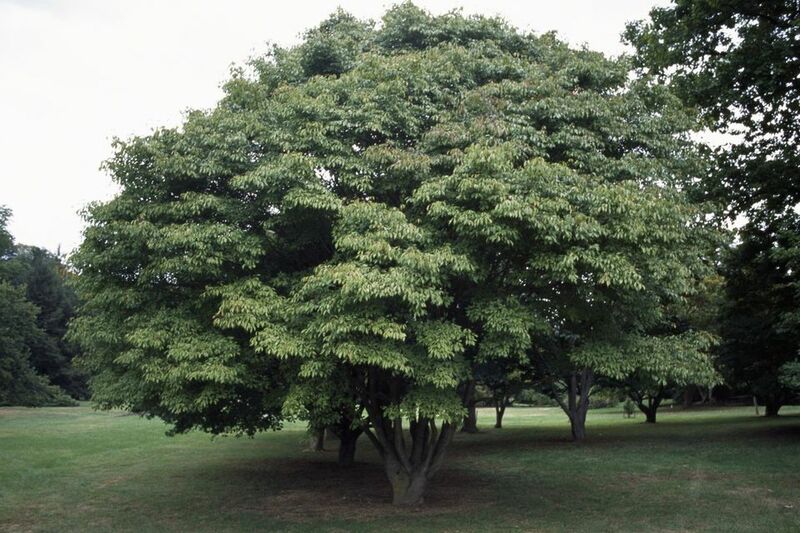 For optimal growth find a site that will provide full sun to partial shade for your maple tree. Each trifoliate leaf on Acer cissifolium is comprised of three leaflets. If you put them together side by side, you can see the familiar maple leaf shape. As mentioned above, the name vine leaf maple is used because they resemble those of Cissus vines. In the fall they may stay green or will change to red or yellow. This maple tree is dioecious. You would usually need both a male and female for fruit production, but this species is able to reproduce through parthenogenesis and you only need a female tree if space is limited. The fruits produced are the familiar winged samaras. Each one measures up to 1" long. They start out green and gradually turn brown as they mature. This species of maple tree does well under drought conditions. It can be used as a specimen tree much like the Japanese maple. Acer cissifolium prefers acidic soil. As long as your pH is not too alkaline, you can try making the soil more acidic, though this will require long term maintenance to make sure the pH does not rise again. You can propagate this tree through seed germination and layering. The vine leaf maple should be pruned during the winter since maple trees will tend to bleed sap if trimmed in the spring. Aphids may be controlled through beneficial insects like ladybugs. You can also use a hose to shoot streams of water directly at them or use an organic insecticide like insecticidal soap. Borers can be difficult to control. One of the key steps for beetle control is to keep the tree healthy and happy. This will prevent open wounds and stress which may attract the borers. Caterpillars will chew through the leaves and cause the tree to defoliate. One organic pesticide that you can use is Bacillus thuringiensis, which is a kind of bacteria. Mites like the spider mite can be treated with insecticidal soaps or horticultural oils. These should be used on a cool calm day to prevent leaf scorch. You can also introduce beneficial insects or use a hose to wash off the mites. Scales can also be treated with horticultural oil. Cankers should be removed so they do not grow and spread throughout the branches. Work on ensuring tree health so that it can fight off invading pests and diseases. Leaf spots are formed by fungal infections. Each fall you should remove the leaves which will help contain the problem. In most cases a fungicide is not needed as most trees are able to survive an attack. It also may take several applications to destroy the fungi or the fungicide may fail to completely eradicate the disease. Root rots may form if the site has poor drainage. Check your watering system to make sure it is functioning properly and adjust settings as needed so the soil is not waterlogged. Tar spot does not usually compromise the health of the tree much besides the potential for the leaves to drop earlier than usual. It is helpful to rake and destroy the leaves once they drop in autumn. This will control the spread of the fungi and improve the appearance of the leaves in the following growing season. Verticillium wilt is difficult to control. You should send off a sample to your local extension service to verify if this is the disease that is present. The fungi can survive despite treatments with fungicides and can live in on the soil. If the problem is severe enough, you may need to remove your vine leaf maple and replace it with a tree or shrub that offers resistance to Verticillium.